As a gardener, I’m always excited to find new ways to make my vegetable patch more pleasing to the eye, so the idea of planting flowers in with my veggies is very appealing on a purely aesthetic level. But interplanting flowers with vegetables isn’t all about prettying up the garden—flowers are beneficial companion plants that can actually help produce grow better! 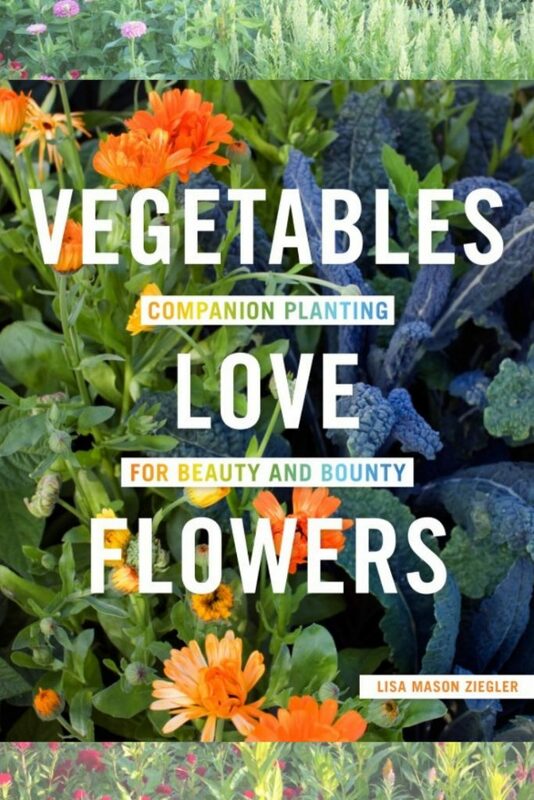 Lisa Ziegler’s fabulous book, Vegetables Love Flowers: Companion Planting for Beauty and Bounty, catalogs the many ways that adding flowers to the garden has helped her grow better produce and spend less effort. Lisa is here today to share how she improved her vegetable yield and made gardening easier through the wonderful magic of flowers. Psst…make sure you read to the end of this post for your chance to win a copy of the book for free! Because I planted flowers on such a grand scale, it was impossible not to notice all the good things the flow­ers were bringing to the table. It felt as though nature hit me right between the eyes with all it had to offer. I had expected a harvest of beautiful blossoms but never dreamed they were also the key to healing my garden, bringing in entertainment, and making gardening eas­ier! The garden grew with less help from me with each passing season. Chatting with gardeners through the years, I’ve learned that the benefits of flowers in the vegetable garden often haven’t been given a chance to develop. Perhaps a large vegetable patch only had a small corner for flowers. Perhaps deadly pesticides were being used. Perhaps flowers were planted in such a way that blossoms were present only sporadically throughout the growing season. These factors may cause the benefits to either vanish or just limp along. Adding a balance of blooming flowers to vegetables gives nature a chance to develop into something, and that something is spectacular! I continue to grow both vegetables and flowers, hand in hand, sharing the same spaces. As I witness nature at work in my garden, it has become easier to walk away from pest problems. All the energy I had been using to resolve problems is now focused on learning more about how to help the garden in order to prevent problems. Adding flowers to the vegetable patch and following nature’s lead is not a magic bullet. It will not fix your garden problems overnight, but it will heal a garden over time. While there are many good reasons to go natural in the garden, the resounding reason that every gardener can get on board with is that it just makes gar­dening easier and more abundant. In my book, I unravel how easy and fun it can be to use nature to prevent and combat problems. My garden today is planned around nature’s workforce as much as it is for the vegetables for our families and our cash crop of cut flowers. 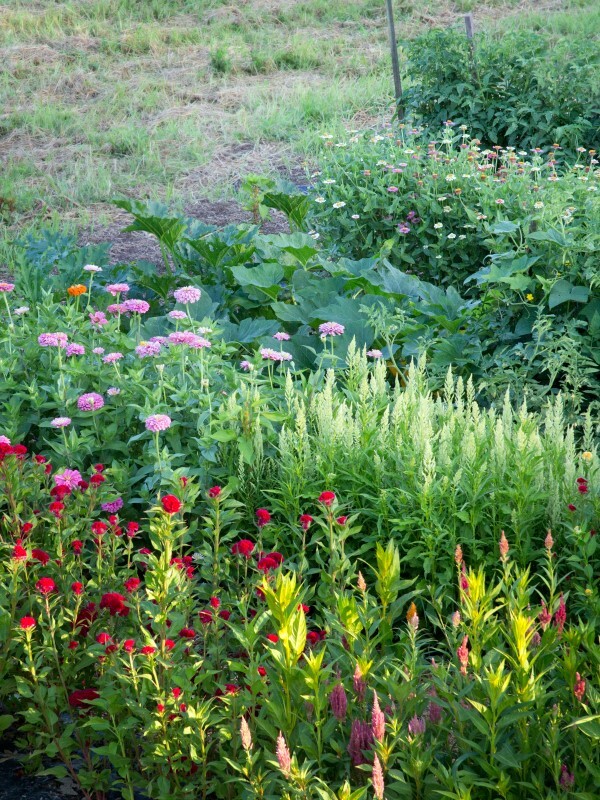 When flowers are coupled with all-natural garden­ing practices, it changes everything. It’s not just adding flowers or stopping the use of pesticides or any other one thing—it’s all those things working together that will invite nature in and let it do what comes naturally to help your garden grow. Now that you know how much vegetables love flowers, you can take these tips from a commercial flower farmer into the home garden by following these practical steps. Plant brightly colored flowers that attract pollinators in your vegetable patch. The more pollinators you have, the healthier your whole garden will be. See more about what to plant for pollinators in this post. Grow marigolds! These cheerful sunny flowers attract beneficial insects and discourage pests. Attract predatory insects. Hoverflies, wasps and green lacewings eat pests, so you want them around your veggie patch! Plant flowers that they love such as chamomile, cosmos, and daisies. Plant lavender near your veggies. Humans generally love the fragrance of lavender, but it is too strong for crop-eating bugs and deer who view your vegetable garden as their own personal buffet. 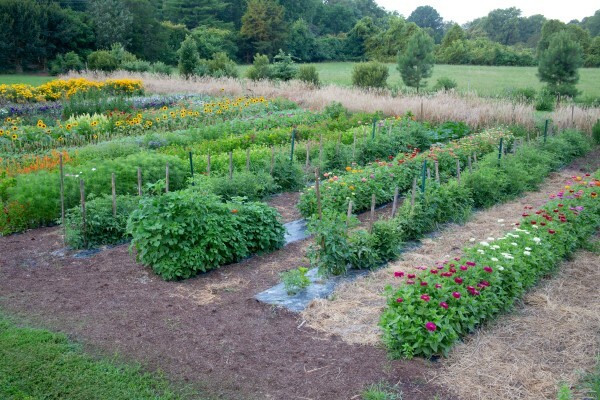 The scent will deter bad bugs and deer, while covering up the smell of your vegetable plants. Give aphids something else to munch on so that they leave your precious vegetables alone. Aphids love nasturtiums, so why not plant a few just for them? They will distract the aphids from nibbling on the crops you care about most. 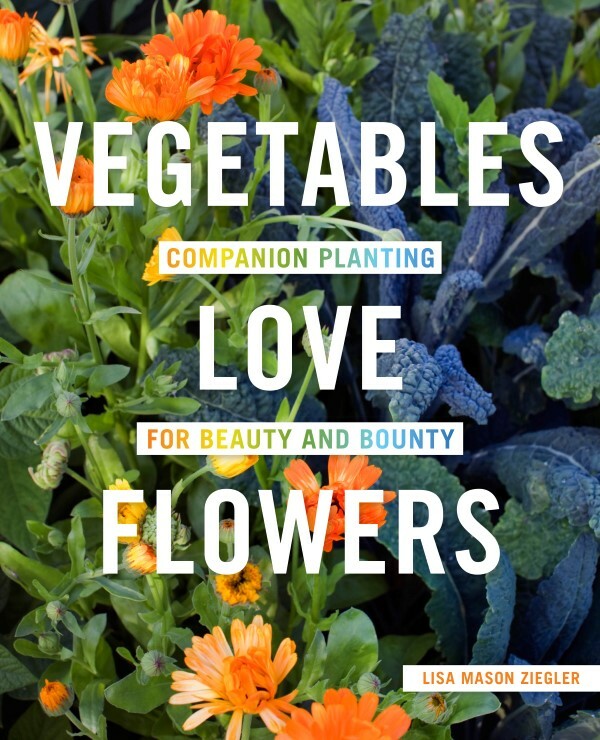 Printed with permission from Vegetables Love Flowers: Companion Planting for Beauty and Bounty by Lisa Ziegler © 2018. Published by Cool Springs Press. Photography by Bob Schamerhorn. This contest is now closed. Congratulations to our winner Ailsa! 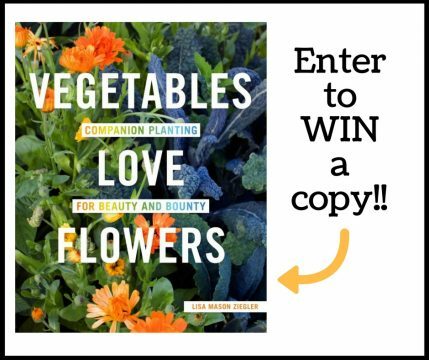 Once you have the book, you can also sign up for a Free Virtual Book Study to get a weekly video for each of the chapters in Vegetables Love Flowers delivered to your inbox. Author Lisa Mason Ziegler digs deeper into the big picture of the book, chapter-by-chapter sharing her insights and experiences. How fun! Lisa Mason Ziegler is a commercial cut-flower farmer, author, frequent speaker, and renowned expert on cut-flower gardening. Lisa’s sustainable and organic experiences have been gathered from everyday life on her cut-flower farm nestled in the city of Newport News, Virginia. 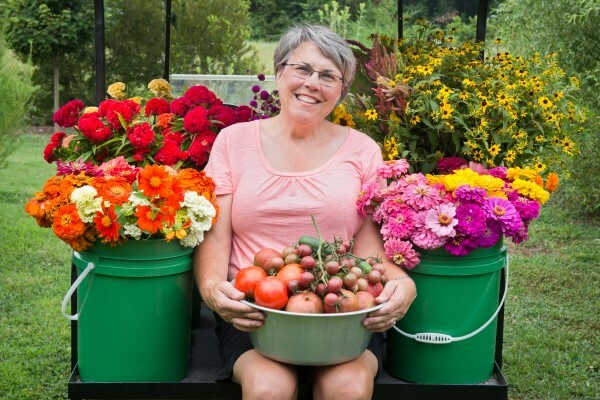 Lisa sells her flowers to Colonial Williamsburg, florists, upscale grocery stores, and on the farm to Garden Share members. Her working one-and-a-half acre cutting gardens produce over 15,000 stems of flowers a week in season. Lisa’s books, DVDs, and programs incorporate her simple methods that inspire and delight. Good information. I have always loved including marigolds in my garden. I will have to include other varieties of flowers! Great information! I grew sugar snap peas. As soon as the we’re ready to pick. Aphids showed up overnight and covered everyone of them. We had trellised our snap peas. They were ruined in such a short time. Didn’t plant anything for awhile. Trying again with some other vegetables. Pole beans and tomatoes. I love cut flowers. This is right up my alley. Your information sounds wonderful! Two years ago I had a problem with Japanese Beetles on my Basil plants, so last year I planted marigolds around my Basil plants and happily I did not see one beetle on my Basil. I can’t wait to see all your tips and tricks for the garden! I also love the idea of marigolds with my veggies. Maybe borage too! I like the seeds of your flowers, I would like to have a garden of flowers and vegetables right at my house.